Jumping Jack Google AIY Project for the Raspberry Pi @Raspberry_Pi #PiDay #RaspberryPi « Adafruit Industries – Makers, hackers, artists, designers and engineers! So you have got that AIY voice kit for Christmas, and have been playing with it, following the instructions. The project described in the following presents a simple device that can be build using the AIY voice HAT for the Raspberry Pi. 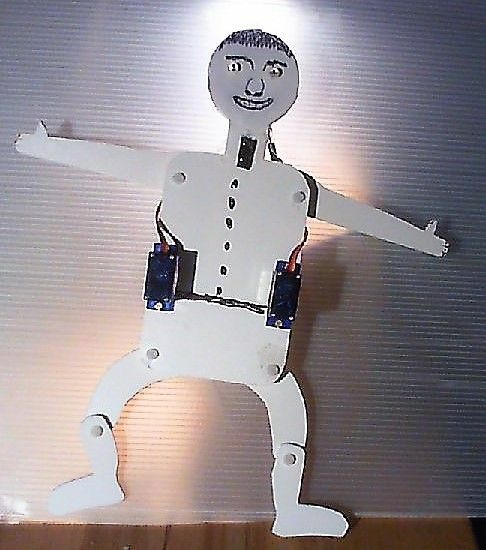 It uses the Google voice recognition system to control LEDs and two servos, driving the arms and legs of a jumping jack by a very simple gear. The software working in the background is a modification of the servo_demo.py script, as it has been described in the AIY voice kit manual. Just follow the instructions given there to set up hard- and software. The device itself is easy to build and requires not much handcrafting skills. In addition a cutter knife, a drill and a soldering iron would be helpful. If you activate the voice recognition system with a wink of your hand and say ‘hands up’ the jumping jack will raise hands and legs, ‘hands center’ will move both servos to the middle position and on ‘hands down’ hands and legs will be lowered. On ‘left up’ the left hand and legs will be raised and on “right down” the right ones lowered, on ‘right up’ vice versa. “Dance”, will make it dance, well at least kind of. It is also talking, please have a look on the attached video. So with little efforts, you can build your own dancing, chatting and singing robot.